Was browsing through the card database when I came across the Starving Venom cards. As an old Predaplant player, it had always bothered me that said cards had little to no connection to the GX era cards, so seeing them again, I decided to try and do that. I looked at the boss Fusions' materials, and found that perhaps making some Pendulum support for said old cards might work. Then, expanding into the Starving part of Starving Venom, I decided to try and have a theme of placing Venom Counters to activate effects, i.e. starving to bite stuff. Then, to go back to Vennom, I threw in another theme of destruction, and topped it all off with some Venom Swamp support. 1 Snake Deity card to add to the mix, and then a thematic Fusion card. And now you have these monstrosities. 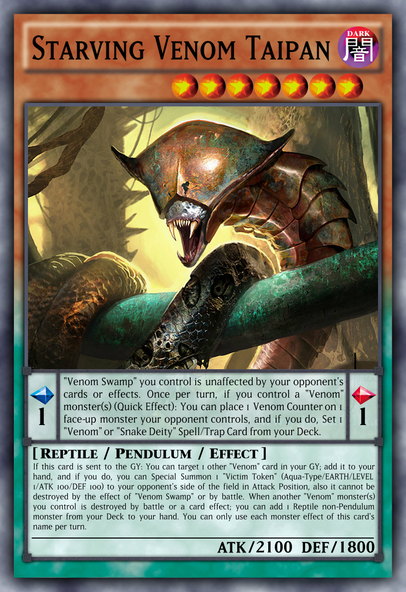 "Venom Swamp" you control is unaffected by your opponent's cards or effects. Once per turn, if you control a "Venom" monster(s) (Quick Effect): You can target 1 face-up monster your opponent controls; place 1 Venom Counter on it, and if you do, draw 1 card. 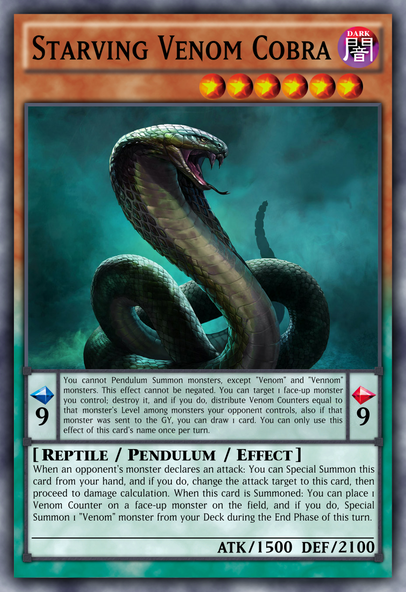 Once per turn: You can target 1 monster you control; destroy it, and if you do, you can add 1 "Venom" or "Snake Deity" card from your Deck to your hand. You can banish this card from your GY, then target 1 "Venom" monster in your GY; Special Summon it. You can only use this effect of this card's name once per turn. You cannot Pendulum Summon monsters, except "Venom" and "Vennom" monsters. This effect cannot be negated. You can target 1 face-up monster you control; destroy it, and if you do, distribute Venom Counters equal to that monster's Level among monsters your opponent controls, also if that monster was sent to the GY, you can draw 1 card. You can only use this effect of this card's name once per turn. When an opponent's monster declares an attack: You can Special Summon this card from your hand, and if you do, change the attack target to this card, then proceed to damage calculation. When this card is Summoned: You can place 1 Venom Counter on a face-up monster on the field, and if you do, Special Summon 1 "Venom" monster from your Deck during the End Phase of this turn. "Venom Swamp" you control is unaffected by your opponent's cards or effects. Once per turn, if you control a "Venom" monster(s) (Quick Effect): You can place 1 Venom Counter on 1 face-up monster your opponent controls, and if you do, Set 1 "Venom" or "Snake Deity" Spell/Trap Card from your Deck. If this card is sent to the GY: You can target 1 other "Venom" card in your GY; add it to your hand, and if you do, you can Special Summon 1 "Victim Token" (Aqua-Type/EARTH/LEVEL 1/ATK 100/DEF 100) to your opponent's side of the field in Attack Position, also it cannot be destroyed by the effect of "Venom Swamp" or by battle. 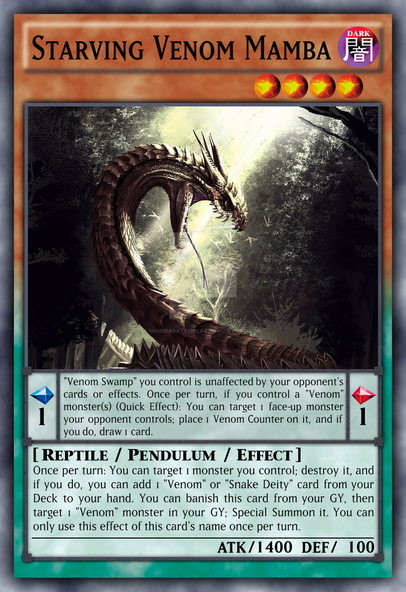 When another "Venom" monster(s) you control is destroyed by battle or a card effect; you can add 1 Reptile non-Pendulum monster from your Deck to your hand. You can only use each monster effect of this card's name per turn. You cannot Pendulum Summon monsters, except "Venom" and "Vennom" monsters. This effect cannot be negated. You can send 1 "Venom" monster from face-up in your Extra Deck to the GY; add 1 "Venom" monster with a different name to that target from your Deck to your hand. You can only use this effect of this card's name once per turn. Once per turn (Quick Effect): You can target 1 face-up monster with a Venom Counter(s); negate its effects until the end of this turn. If this card is destroyed by battle or by card effect: You can target 1 "Venom" monster in your GY; place 1 Venom Counter on 1 face-up monster on the field, and if you do, Special Summon that target. You can only use this effect of this card's name once per turn. 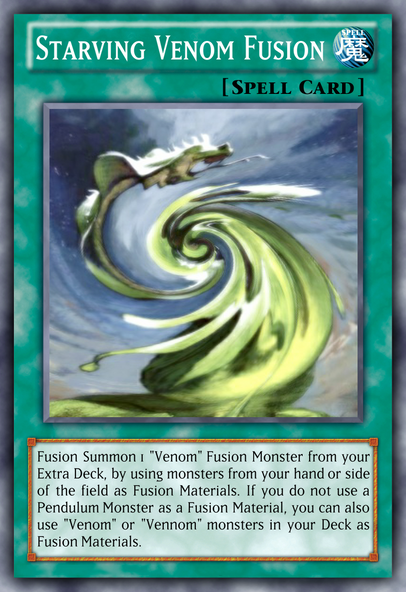 Fusion Summon 1 "Venom" Fusion Monster from your Extra Deck, by using monsters from your hand or side of the field as Fusion Materials. 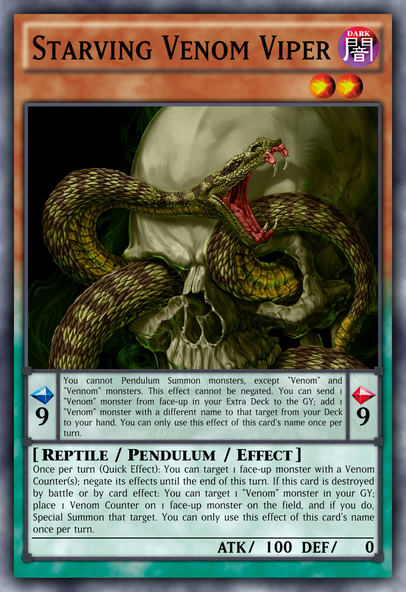 If you do not use a Pendulum Monster as a Fusion Material, you can also use "Venom" or "Vennom" monsters in your Deck as Fusion Materials. 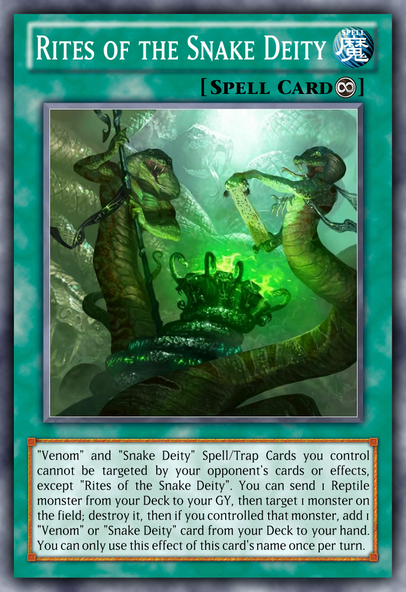 "Venom" and "Snake Deity" Spell/Trap Cards you control cannot be targeted by your opponent's cards or effects, except "Rites of the Snake Deity". You can send 1 Reptile monster from your Deck to your GY, then target 1 monster on the field; destroy it, then if you controlled that monster, add 1 "Venom" or "Snake Deity" card from your Deck to your hand. You can only use this effect of this card's name once per turn. Really love those new Venom cards. Konami really dropped the ball when it comes to that archetype. I just have a few questions about some of the cards you made. Viper: That guy is great but the wording of its Pendulum effect could be confusing. Why not simply write ‘’send 1 ‘’Venom’’ Pendulum monster from your Extra Deck to the GY’’? Fusion: If your intent is to use Starving Venom Fusion Dragon, you should add some clause to your Fusion card to allow Starving Venom Fusion Dragon to be summoned via monsters from the hand or something (right now, he can only be summoned using DARK materials from the field). Rites: Great card but I think it should be a Continuous Spell. Although I could be mistaking, but, by reading its effect, I believe that might have been the original the intent with this one. Mamba is a very powerful monster, I have to say. Counter spreading that gives you draw power, destructive search power, and Graveyard revival? Yes please. However . . . I do wonder how you intend to get Mamba in the Graveyard on any consistent basis. Jesus, Cobra, chill. Easy Counter spreading, and a potential draw, that only requires that you pop a monster? Holy Vennominaga setup, Batman! It's also a battle hand trap that places a Counter and gives you a free monster, so definitely a 3-of. Also, offhand: "among monsters your opponent controls". Taipan is a confusing card as far as its Monster Effect goes, especially considering the million and one uses of a free Token, but giving you more cheap advantage is nice. Outside of Starving Viper, how are you putting this in the Graveyard? Viper does a really sweet job of setting up for the others. That's all I have to say about that. Starving Venom Fusion gives you all of 3 options in the TCG, and 8 in the AGM if I remember correctly, but that's okay because it does everything it needs to. Pretty good! I'm guessing Rites is supposed to be a Continuous Spell? Viper: Unfortunately, there's a Pendulum Xyz Fusion Monster target: Odd-Eyes Venom Dragon. Needed to get around that. Rites: Yes, meant to be a continuous. I was thinking of Venom Shot and Snake Rain, particularly the latter as it is searchable, for the GY enabling effects. Thanks for the OCG fix! Thanks in general for the comments! Will update shortly. Um, Dova? Odd-Eyes Venom Dragon is a Pendulum Fusion, not an Xyz. Requires 1 "Odd-Eyes" monster and 1 "Starving Venom" monster, which made me think that these were trying to turbo out OEVD with Pendulum Dragon as a search card. Also, I hope you don't mind, but this was added to the AGM, given that it was designed by one member (you) and approved by another (me). Yes, meant Fusion. I had that in mind, and I thought Odd-Eyes would make a nice tech, as it can search all of these save Taipan. It's in the AGM now? Great!